I have Jaya V Shenoy's cookbook in English which helped me to build up my basics of Amchi cuisine. During one of my vacation when I went to my aunt's place [who is a great cook] I saw she too had Jaya V Shenoy's cookbook in kannada [guess most of amchi girls would have bought one when they went to sasural]. Upon comparing the recipes with ones that are present in my book I felt I am missing on major recipes from that book ,, the only problem with book was kannada script [ I learnt the script after my graduation and now for past 10 years no contact with it and hence I struggle to read in this language]. With hubby's suggestion photocopied the whole book and now with his help only, I type the required recipes in english as he reads out to me from the photocopied book [I can understand it very easily]. 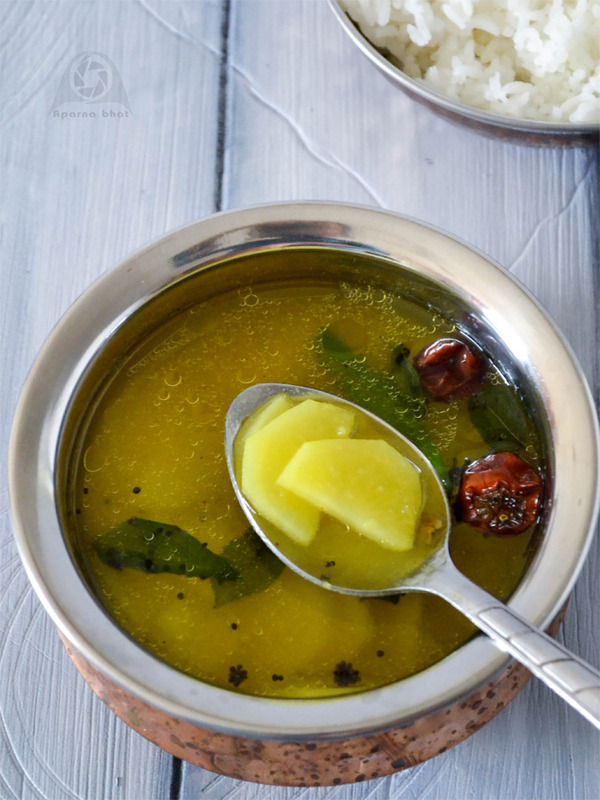 So today I am posting a very simple soupy preparation from potatoes, and its "Batate toi" from "Oota Uphara" by Jaya V Shenoy. I adjusted the quantity of ingredients as per my preference for consistency and added little turmeric for that nice color. Take asaofoetida [size less than pigeon pea] and dissolve it in water. We call it hinga uddak. Keep it aside. Boil 4 medium sized potatoes. Once boiled, peel the skin, mash 2 of the potatoes and slice the other two into thin triangular slices [see in the below pic]. Take it in a vessel add 2 -2.5 cups of water. Stir in well. Add slit green chilli, salt to taste and allow it boil. Once the boiling starts switch off the flame. In a small saucepan, heat oil [preferably coconut oil]. Add mustard seeds and as they splutter add curry leaves and red chillies. Pour the seasoning on the batate toi. 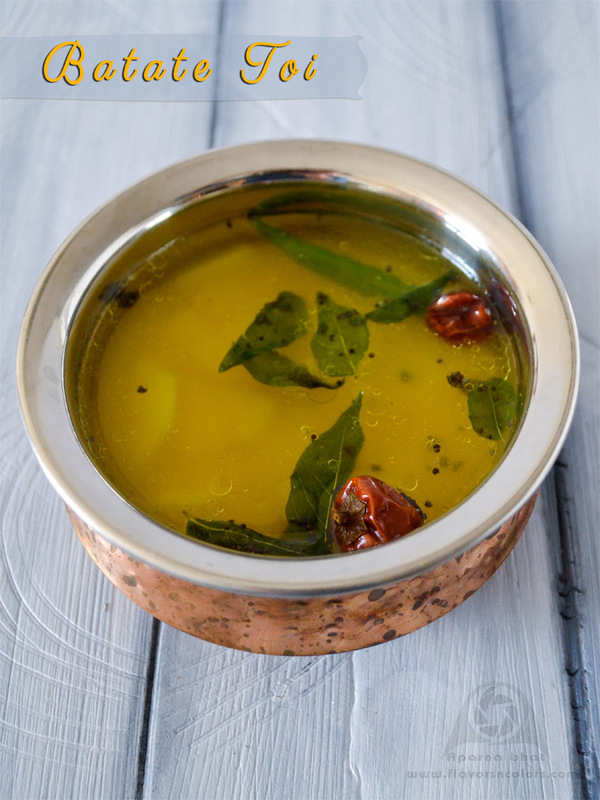 Pour hinga uddak [asafoetida dissolved in water] over the toi and keep it covered with lid , this will help to retain the flavours of spices used for seasoning as well as asafoetida. This batata poi looks very comforting, quite a new dish for me.